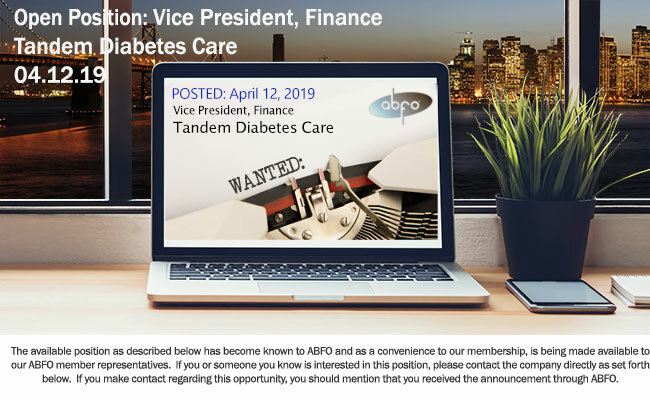 Responsible for functional management and leadership of all Finance related activities of Tandem Diabetes Care and affiliates. Responsible for the development and implementation of strategies to meet organization objectives. Oversee operations and coordination of the Finance, Accounting, Tax Compliance, Financial Planning & Analysis and external reporting functions. Responsible for the preparation, delivery and presentation of financial and administration reports. In the absence of the CFO, assumes administrative responsibility for the organization’s operations. A San Diego-based medical device company, named a Best Place to Work through the San Diego Business Journal, that’s been making the lives of people with diabetes better and better through relentless innovation and revolutionary customer experience since 2008. Responsible for the strategic direction and development of finance functions and internal control processes to promote the organized growth of Tandem’s operations and expansion of its business. Facilitates the implementation and monitoring of new financial, logistical and reporting processes and internal controls that span over multiple departments. Interfaces directly with Audit Committee, Board of Directors, shareholders, potential investors, security analysts and regulatory agencies regarding financial matters of the Company. Oversees the management of Finance, Accounting, Tax Compliance, Financial Planning & Analysis, stock administration and external reporting functions. Oversees financial modeling and forecasting functions to provide an understanding of the economics of the company’s activities and of the industry, analyze various strategic and tactical alternatives and develop appropriate financial strategies to ensure the Company’s success. Meets regularly with department VPs and directors to keep informed and to offer direction. Reviews reports to analyze historical results and future projections, and suggests methods of improving the planning process as appropriate. Analyzes Company operations to pinpoint opportunities for improvements in effectiveness or efficiency. Studies long-range economic trends and projects Company prospects for future growth in overall sales and market share, opportunities for acquisitions or expansion into new product areas. Estimates requirements for capital, land, buildings, and changes in the work force. Bachelor’s degree in business administration, accounting, or finance or equivalent combination of education and applicable job experience. 15 years experience in financial management with increasing responsibilities for multi-faceted direction and planning. 10 years in a senior financial management role in a publicly traded commercial company. Experience in a senior financial role in the medical device industry or a related industry. We offer a robust benefits package to support your health and your family. From medical, dental, and vision, to flexible spending accounts for both health and dependent care – Tandem’s got you covered! Enjoy the outdoors during your workday by biking, running, or walking on one of our nearby trails. Or, break a quick sweat at our offsite gym, which boasts luxurious amenities including specialty fitness classes and state-of-the-art equipment. Tandem offers all regular full-time employees a company-sponsored 401(k) plan as well as the potential for stock options. Join in monthly employee get-togethers, tacos for Cinco de Mayo, corned beef for St. Patrick’s day, and the annual JDRF walk. We rely on new ideas, and people who keep their minds open to how to make them happen, to deliver products that can change people’s lives. When faced with a revolutionary concept, whether it be for a new product, or even just a new way to organize the supply room, we try to say yes (or at least maybe) before we say no. Making things more efficient and cost effective is great! Taking shortcuts is not. People’s lives depend on us, so holding ourselves to the highest ethical standards and delivering exceptional quality in everything we do isn’t just something we value, it’s something we require. Don’t let the jeans and board shorts fool you. We are very serious about our work. We also recognize that the happiest people are the most productive people, and we foster an environment to support that.